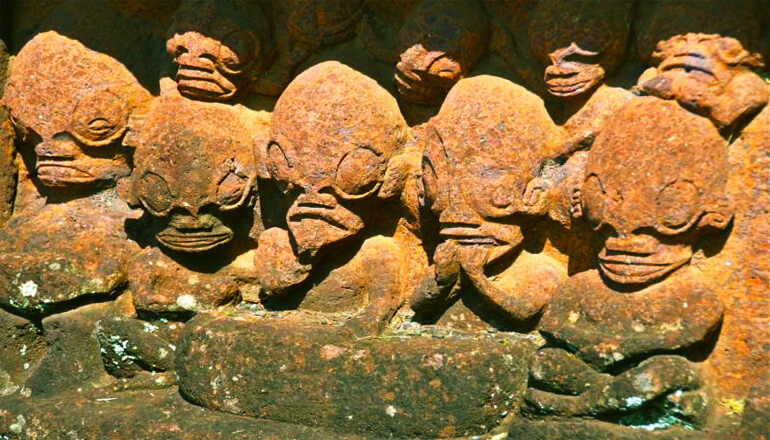 Are these statues ancient representations of alien beings? Undoubtedly, the original meaning and purpose of a great deal of ancient artwork have been lost over time. What started as an abstract representation in the mind of the ancient artist might be considered an accurate depiction of historical facts. While this might be the case with the Temehea Tohua statues, the similarity between the stone carvings and modern portrayals of extraterrestrials are striking. The statues can be found on Nuku Hiva, the largest island of the Marquesas Archipelago in French Polynesia. Europeans reached the Marquesass in the last decade of the 16th century but the islands are thought to have been settled by Polynesians sometimes before 100 AD. On an interesting note, in the South Marquesan dialect, the island was called Te Fenua ‘Enata, meaning “The Land of Men.” As opposed to aliens, perhaps? Some of the ancient statues on the Nuku Hiva island appear to depict beings from another world. Are they just a product of artistic imagination? Did they serve a ceremonial role and nothing more? Could they be records carved in stone as a memento of an archaic alien contact? Some of the sculptures show beings with disproportionately large and elongated heads, gaping mouths and huge eyes. Another type shows beings with a bizarre mix of human and alien traits. Some ufologists believe the statues actually depict two alien races: Reptilians and Greys. The Lizard People from the constellation of Draco appear in multiple conspiracy theories. Evil and manipulative, this advanced alien race is said to be secretly controlling mankind from the shadows. Did they make an appearance on the Marquesas Islands thousands of years ago, leading the locals into worshiping them as gods? Modern reports of Grey aliens describe them as 3 to 4 feet tall humanoids with large heads and huge elliptic eyes. Some of the statues bear a striking resemblance to this extraterrestrial species. So, are these stone carvings nothing but tikis belonging to Polynesian culture or is there something more to them? One thing appears certain: the beings they depict are not human.